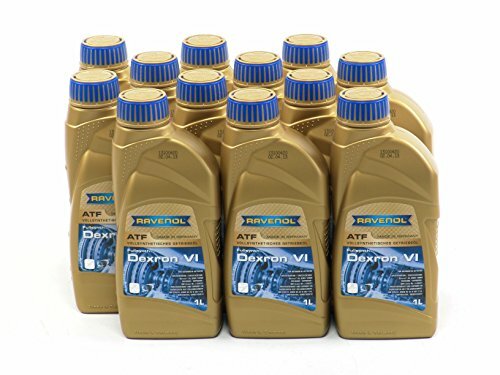 RAVENOL ATF Dexron VI is an automatic transmission oil (ATF) on the basis of the latest technology of the HC/HT hydrocrack oils which is approved by General Motors for the use in vehicles with automatic transmissions. Because of the special formulation the durability is twice that of comparable Dexron VI ATF fluids. RAVENOL Dexron VI is completely backward compatible with DEXRON III, III H, and II E applications. RAVENOL Dexron VI fulfils the transmission oil specifications of General Motors for all vehicles with hydramatic automatic transmissions from 2006 on. RAVENOL ATF Dexron VI is recommended for all GM vehicles with hydramatic - automatic transmissions from 2006. RAVENOL ATF Dexron VI is completely backward compatible with DEXRON III (H)-, III- and IIE-applications. Follow the recommendations of the instruction manual of your vehicle. Always consult your service manual and confirm the specific fluid requirements for your model. DEXRON VI is a registered brand name of General Motors Corporation.